I've been a student of Zen for thirty years now. Zen meditation is my core spiritual practice. I do it because of that broken glass. My life, like so many of our lives, has been marked by death and suffering. I look around and I see our existence rising and falling, and I feel pushed into a serious and sustained exploration of the essential nature of it all. For me this has come down to doing two things: shikantaza and koans. 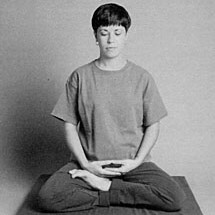 Shikantaza, or "just sitting," is the primary meditation practice of Zen. But this “just sitting” is not passive. Rather, in sitting, one tries hard simply to be aware. And in so doing a dynamic process rises where the various things of our lives, out in the environment and from deep within our bodies, is each revealed. As a complement to shikantaza, I study koans, from the Chinese Kung-an, or "public case," as in a public document. Koans are stories and brief statements that become objects of meditation and present the opportunity for brief and deeply intimate conversations with a spiritual director. To engage a koan is to allow the possibility of awakening to the real nature of things. So, each in their own way, shikantaza and koan study help me to understand the actual nature of this "already broken" that marks all things. It is a lesson that is eternal and, in some ways, must constantly be relearned. There is part of us that recoils at transience and wishes things were permanent. Zen meditation is a medicine against this illness of clinging to the passing as if it were permanent. Now, while I meditate regularly and go on intensive retreats frequently, the proof of this practice comes out in daily life. Zen really is about living our lives each moment by that moment, each day by that day. Seasons have come when members of my family have been quite ill, close friends diagnosed with cancer or suffering setbacks in their lives. And too many people die -- sometimes without warning, as an accident or blindingly quick illness; sometimes marked with feelings of bitterness and regret that will never be addressed with any satisfaction. How precious and precarious all things are. This is true of glasses, and of pets, spouses, parents, children, siblings, and friends. It can be very hard to just enjoy it incredibly. Even though sitting zen is physically demanding -- traditionally one sits in a lotus or half-lotus position on a cushion on the ground, for half-an-hour at a time -- I've found it worth experiencing the difficulties. It's important to emphasize the difficulties, both physical and mental, for difficulties are the path of spiritual discipline. To attempt to sit silently and be aware is to become aware. And what we become aware of is a jumble mush of dancing monkeys. Our minds are filled with thoughts and emotions racing and raging. When we actually sit and notice, we discover much about ourselves, and a fair amount of it isn't particularly pleasant. But as the mind quiets a bit, other things are also revealed. We begin, perhaps, to notice the many springs of our lives. Not only are there difficulties and endings, but there are also beginnings. This slowing down and noticing is an opportunity. And this opportunity is a chance to notice the passingness of things, the precious fragility of everything – a single blade of grass, a much loved coffee mug, a fading photograph, a quick kiss. When we really attend, we may find all moments speak of the wonder and the transitoriness of life and death within the interdependent web. I've found that, as hard as it can be to face, there is beauty and wonder in this existence. The simple truth is that this very moment is the only place we will find joy and love and meaning. Whenever I'm reminded of this, I realize how grateful I am for my practice and my spiritual guides. My Zen practices are the truest of the many reminders I've ever had. Perhaps we all need such reminding. Certainly, as we notice the breath, we find a new season, a new beginning. With each breath, with each moment noticed, we find hope is within us. And, this hope may reign so long as our blood pounds through our bodies. Because of our clinging to what is passing as if it were permanent, we miss what is actually going on. We need to wake up from the drowsiness of clinging. Zen is all about waking up. Zen practice is about noticing the luminous quality of the ordinary. I sit still and notice. I engage a koan and notice. I notice how everything is already broken and there to be enjoyed incredibly: including glasses -- and you and me. The great play of the cosmos, our rising and falling, is the precious web of existence. When we take up a practice like Zen, we can come to know this as liberating, as freeing, as our true heritage. We so easily get caught up in the mix of things. We need to pause and remember the glass really is already broken. This pause is important, because it awakens us. However we do it -- in sitting Zen or some other practice -- I hope we will completely engage that pause, that invitation to enjoy incredibly!